These great passenger ships carried millions of people across the oceans until they were made obsolete by jet airliners. They included such famous ships as the Great Western, Deutschland, Lusitania, Titanic, Ile de France, Queen Mary, Queen Elizabeth, Normandie, and United States. The North Atlantic was by far the most frequently traveled route. The early 20th century saw the liners competing to provide the greatest luxuries. The fastest ship received the Blue Riband, an honorary award dating back to 1838. The SS United States made her maiden voyage on July 4, 1952, and set both the eastbound and westbound speed records. That was over a half-century ago, but her speed records have never been broken. 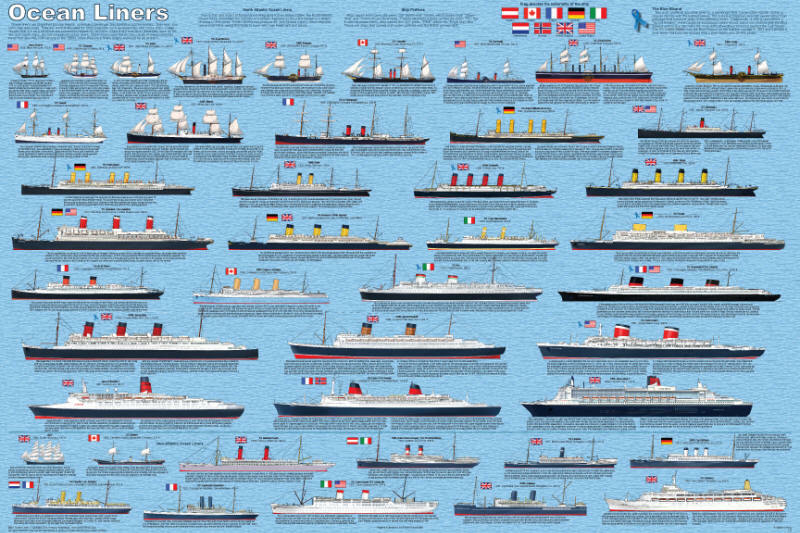 This poster is a history of the ocean liner from its humble beginnings through the recently produced Queen Mary 2. An outstanding original illustration of each of the 37 ships is accompanied by the name of owner line, the date launched, overall length, a brief history, and a flag icon representing her nation. Blue Riband winners are indicated by a blue ribbon icon. The two bottom rows shows ships that sailed the Pacific Ocean.